Madison’s fixed cover digester and fiberglass enclosure over flame arrester and pressure/vacuum relief device before lightning struck. The day of October 16, 2016 in Madison, Wisconsin began with thunder and lightning. 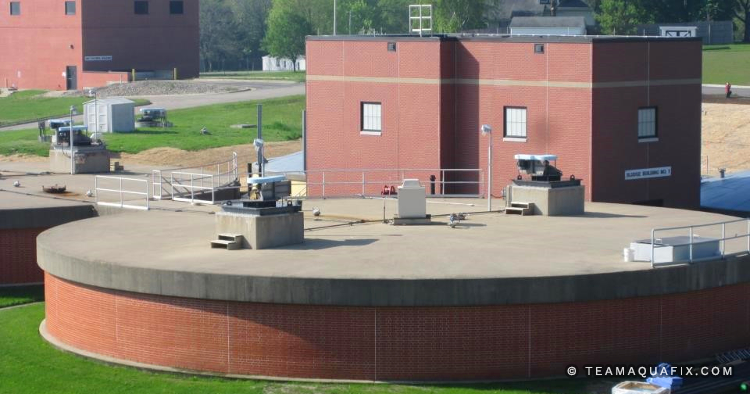 As the employees of Madison Metropolitan Sewerage District arrived at work, lightning struck the fiberglass enclosure of their pressure regulator and flame arrester on top of the digester. A fire was sparked and quickly grew with heat intense enough to melt the lead weights in the pressure regulator. This whole time the digester was operating and generating highly flammable methane gas. Employees were evacuating the area as the fire was extinguished, but the big event they were all bracing for never happened. There was no explosion! So many anaerobic treatment facilities have had explosions in the nearly the same situation. Madison’s gas collection and storage system was designed with the necessary safety equipment. There is a flame arrester between every possible flame source and the stored methane. (Flame arresters have corrugated metal windings that reduce heat below the flash point to prevent ignition of the stored gas). It was not just good luck that prevented the explosion; Madison’s planned maintenance program includes inspection and thorough maintenance of all flash arresters. Good maintenance and design are huge steps towards preventing a possible explosion. But maintaining the proper temperature, mixing, and feed rates, are possibly the most important method for prevention of an explosion. The world is looking to biogas more and more each day as an energy solution. Anaerobic digesters can handle concentrated high strength wastes and at the same time, produce a usable byproduct – methane gas. With proper treatment and handling, methane can be used like natural gas to generate heat and electric power. Because of this, anaerobic digesters are being built for many new municipal, industrial, and agricultural applications. These anaerobic systems are being designed in a myriad of differing configurations and applications. But this rising popularity doesn’t always provide operators with the whole story. If you look up articles about the upside of using anaerobic digestion, you will find articles like, “Biogas from Energy Crop Digestion” (3). If, however, you do a word search for “hazard” or “safety” in the articles about the anaerobic process – more often than not, the search will report “no matches.” These articles also fail to mention training employees to be able to successfully operate, maintain, and troubleshoot the system to keep it performing as expected. But more importantly, anaerobic proponents fail to mention necessary safety training concerning confined space entry procedures and prevention of fire and explosions. Flame arrester that was in the fire, keeping the fire from reaching the gas storage area. Poor training and supervision of operators of anaerobic systems will lead to bad information causing unsafe practices and forgotten maintenance tasks. This can result in burns, explosions, and death by asphyxiation or poisonous hydrogen sulfide (H2S). Past training efforts on the municipal level have resulted in a pool of well-trained municipal operators. Operators of industrial anaerobic systems and operators of rural cattle manure digesters, however, often do not have the same level of safety training and training in proper operation of anaerobic systems as do state-certified operators. Poor operation of these facilities often won’t become known until someone is killed or injured, or there is a massive fish-kill downstream of the system. That means that when you read or hear of a digester explosion, there are many potential explosions that you haven’t heard about! The biggest risk of explosion results from drawing air into the gas storage creating an explosive air/gas mixture. What are common causes of air/gas mixtures? 1. Drawing down a fixed cover digester. To prevent crushing from atmospheric pressure, a pressure regulator valve opens letting air into the digester. Solution: Refilling immediately upon completing draw down will force most of the air out of the digester and significantly shorten period of time with an air/gas mixture. 2. Drawing a floating cover down to the corbels and then continuing the draw down will allow air to enter digester. Air is normally kept out of a floating cover digester by the water seal between cover and wall. Solution: Thorough ventilation as digester is being drawn down will take methane levels below the explosive range as well as eventually making safe confined entry procedures possible if special cleaning and repairs are needed. Startup after all mechanical equipment is in working order should involve driving as much air out of the storage area as possible and resuming digester operation to increase methane content above the explosive limit as quickly as possible. 3. 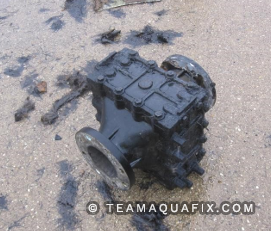 A jammed and tipped floating cover can cause loss of the water seal. This can be caused by failure of the guides, ice in winter, or an excessive foaming event. Solution: This is a potentially dangerous situation and will require specialized equipment like a crane to get cover back into the right position. 4. An operational change of a chronically “sour” digester resulting in sudden methane production. Solution: Sour digesters produce quantities of carbon dioxide which in itself is a fire extinguisher. When starting up a sour digester, you need to be very careful about checking out gas handling and safety devices. This is to be sure air is not getting into the digester to create an explosive mixture of newly produced methane. Also in correcting a sour digester the use of a strong base like sodium carbonate, can remove the carbon dioxide from the gas storage area. This will result in drawing air into the digester as the vacuum relief valve opens to protect the digester from crushing atmospheric pressure. Many cases of air/gas mixtures are related to emptying, cleaning, and refilling digesters. It is well worth the investment to hire firms that are experienced and equipped to properly clean and repair digesters. A tragic accident in Pennsylvania (2) resulted in deaths of a father and son working inside a digester. They were working to move thickened sludge to a pump intake. They were using forced air to stir the sludge which released trapped methane while mixing it with forced air. An (unapproved) electric light they were using broke and ignited the gas. Their deaths were caused by air/gas mixture and an ignition source but in reality, the cause was not having an experienced and properly equipped professional crew doing the job. In discussing the explosion that did not happen, I have not yet addressed the lightning strike that caused the fire in Madison. In researching this topic, I had the opportunity to discuss the strike with Jim Grasty, an engineer systems manager with Alltec. Jim Grasty has had over 30 years of experience in the field of lightning protection, surge suppression, and grounding site surveys. He has led over a hundred surveys and designs for lightning protection and electrostatic hazard mitigation in flammable environments. His experience leads him to believe that lightning strikes in flammable environments are much more common than we realize. At any moment, it is estimated that 1,800 thunderstorms are in progress somewhere on Earth. About 100 lightning bolts hit the ground each second! Alltec recommends a three-tier comprehensive facility approach for lightning protection that includes analysis, surge suppression and grounding. 3. The scientific understanding of lightning protection has come a long way from the days of Ben Franklin! Properly designed and operated anaerobic digester systems offer many advantages over alternative systems. Many believe them to represent the future of energy conservation and waste treatment. But anaerobic digesters need to be safely and properly operated and maintained. They need skilled operators to run them, and operators need to be trained and kept current in their field! Glenn Smeaton is a Crabtree Award winning water and wastewater operator trainer. He holds a master degree in water resource management from the University of Wisconsin. Most of his training experience was throughout the state of Wisconsin but he also worked for five years in the Metro Plant in St. Paul, MN. Before retiring Glenn worked 11 years as a training manager for the Madison Metropolitan Sewerage District in Madison, WI. Today he works as a consultant to Aquafix, advising on aerobic and anaerobic safety and training.